Jon Beltram, godan (5th degree black belt), past national director and newly appointed Senior Council member of Shotokan Karate of America, is Kansas City Shotokan Karate's senior instructor. Mr. Beltram began serious martial arts training in 1959 and holds black belts in Judo (Wey Sing Kim, World Judo Champion in 1959), Okinawan Shorei Kempo (under Mel Wise), JKA Shotokan Karate ( under Mr. S. Mikami, 3 time All Japan Champion), Goju Ryu Karate (under Shoichi Yamamoto and Gosei Yamaguchi), and Yun Moo Kwan Tae Kwon Do (under Jang Yul Park, 1958 Champion of Korea). Mr. Beltram was a member of the U.S. Karate Team Which competed for the 1970 World Karate Championship in Tokyo, Japan. Mr. Ohshima awarded him SKA's highest rank, Godan (fifth degree Black Belt) in August, 2000. Mr. Beltram has presented free-fighting and self-defense seminars throughout the United States. You can read some great stories about Mr. Beltram in our 30th Anniversary Album. More than seventy of Mr. Beltram's students (and his student's students) have attained black belt rank. Mike Lyon, yodan (4th degree black belt), has been the director of SKA's Midwest Region since appointed by Mr. Ohshima in 1988. After boxing as a child, he began jiyu-jitsu training while a student at the University of Pennsylvania in 1969. Mr. Lyon began serious study of martial arts when Andy Brown introduced him to Jon Beltram in 1984. 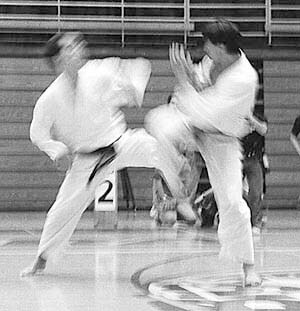 In 1989, Mr. Lyon won the 2nd place medal for team kumite at SKA's annual Nisei Week championship in Los Angeles. In 1991, he won 1st place for black belt kata at the SKA's Midwest championship tournament in Chicago. A few weeks later, he was selected to demonstrate jiyu-ippon kumite at the 60th Anniversary of the Waseda University Karate Club in Tokyo, Japan. Mr. Ohshima awarded him the rank of yodan (4th degree black belt) in June of 2003. Mr. Lyon founded the KCAI dojo at the Kansas City Art Institute in 1988, and the AT&T dojo in 1994. He led practices at both dojos until June of 1999 when he passed leadership along to two of his students, Sarah Oliver and Tom Peacher, who had been awarded the rank of nidan (2nd degree black belt). Mr. Lyon was awarded SKA's Member of the Year for the Midwest in 1988 and 1999 and SKA National Member of the Year for 2003 and 2008. Ten of his direct students have been awarded black belt rank. Named SKA's Midwest Member of the Year in 1991, Mr. Johnson leads the Longview Community College dojo. He began practicing martial arts in 1980, under Jon Beltram, and was awarded the rank of yodan (fourth degree black belt) in Montreal in 2000. Mr. Johnson won first place in the Mid-west SKA Regional Championships in 1991 and 1992 and went on to compete in SKA's 32nd, 33rd, and 35th Nisei Week Karate Exhibition and Tournament. He was one of only ten US delegates selected to compete in SKA's Harmony 1990 International Tournament. He was honored to have been selected by Mr. Ohshima to demonstrate jiyu-kumite in Tokyo, Japan in 1991 at the Waseda University Karate Club 60th Anniversary celebration. Carl led the June 2001 Summer Special Training in Champaign, Illinois. As a committed member of the SKA, Carl continues to contribute much to his students and his fellow members. He strongly believes in "the art of karate do" and remembers well a message from Master Gichin Funakoshi, "The Way: Who will pass it on straight and well?" John Kaczynski began his karate practice in 1978 with Guy Richardson at Longview Community College. In 1981 he also began practicing with Jon Beltram. Mr. Ohshima awarded him the rank of Nidan (2nd degree black belt) in 1991. He has been teaching Karate at Longview since 1988. David Altman began practicing under Jon Beltram in 1977. He was awarded yodan (fourth degree black belt) by Mr. Ohshima in 2001 during the first yodan grading held at the Shotokan Ohshima dojo in Santa Barbara. David is a life member of Shotokan Karate of America, has represented the Midwest in tournament competition several times at the Nisei Week national karate championship in Los Angeles, has completed more than 50 special trainings, and leads the annual Midwest winter special training in DeKalb, Illinois. Russell Petree began practicing JKA Shotokan Karate in 1998 under William Wareham, a police officer and strong shodan who became an SKA member in 2001. Russell joined SKA under Jon Beltram and Carl Johnson in 2002 the same year he began leading practices at Warrensburg dojo after William underwent major surgery and effectively retired from practice. Russell was awarded shodan in 2005 and received Mr. Ohshima's consent to lead the Warrensburg group soon after. Practices are Mondays from 6-8 PM.